We all like a good heart. Whether it be a cut-out valentine, everyone's favorite cardiovascular muscle or even the new, hip verb form (I use it to denote a degree of admiration below "love"), I have yet to meet someone who does not like hearts. In traversing Portland, I found yet another Heart to love. 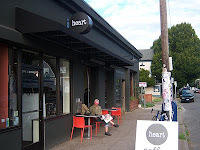 In the lovely neighborhood of Kerns resides one of Portland's newest coffee roasters called Heart Roasters. 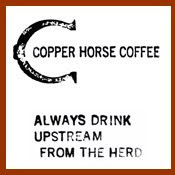 In deciding where to visit while in town, word was that they were doing spectacular things with their coffee and with needing little other reason to visit, I dropped by. Heart's cafe is all together pleasing to the eye. The shell is a simple black face with a large garage door that opens in the nice weather. Inside, the mix of vintage furniture and creative minimalism sets the mood at an oh so inspiring calm. 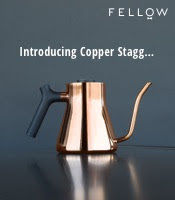 At their spacious coffee bar, they boast two espresso machines, a halogen siphon bar and pour overs. I settled on their Ethiopian Sidama via pour over, an infusion that threw out notes of bright blueberry, sweet hibiscus, mellow fig, lemongrass and a smooth body. This coffee was delicious by and large. For my espresso, I settled on their Kenyan. Pulled short with good crema, the shots lent the flavors of dark lemon, mango, ginger and cocoa. A good balance of flavors and a great single origin espresso. The tea I failed to officially note but I'm pretty sure its free leaf. To put it simply, I definitely hearted my experience at Heart. If you are in the vicinity, dock it. Yet another reason to visit Portland! I also heard someone drew stars and mushrooms on all the bike lanes so it's like playing mariokart! This will definitely be a stop on my next trip to the area!